By now, most people involved with spread spectrum communications are (or should be) aware that Hollywood starlet Hedy Lamarr is credited for being the first to suggest a frequency hopping scheme for secure communications. If you do a Google search on Hedy Lamarr and spread spectrum, you see that except for a few mentions on tech websites, it has only been in the news since the end of the last decade. Scientific American magazine ran an article titled, "Hedy Lamarr: Not Just a Pretty Face," in 2008. Google honored her on November 9 (her birthdate), 2015, with a Doodle on their homepage. "The most beautiful woman in the world," with the assistance of her co-inventor-composer George Antheil, came up with the idea while working on a piano piece. Ms. Lamarr and Mr. Antheil were concerned about the massive torpedo attacks by German U-boats against not only naval ships but passenger and merchant ships in the northern Atlantic ocean. The objective was to discourage supply shipments to Europe, which was already under siege by the Third Reich. Radio-controlled torpedoes were used by Allied forces against Axis warships and submarines, but the signals were easily jammed by high power transmitters broadcasting on the same frequency as the controller. Frequency hopping would allow the controller to change frequency faster than the enemy could keep up with to block. Both the transmitter and the receiver are given an identical schedule of frequencies and times for synchronization (using a player-piano type of tape for programming). Just as your ears and brain can pick out known notes to a melody while ignoring other non-related notes playing simultaneously, the spread spectrum receiver heeds only information on its frequencies and ignores all others. 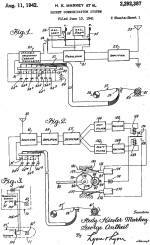 Lamarr and Antheil share the patent titled "Secret Communication System" (US2292387) which was granted on August 11, 1942; however, the military did not adopt the scheme for tactical use until nearly two decades later. 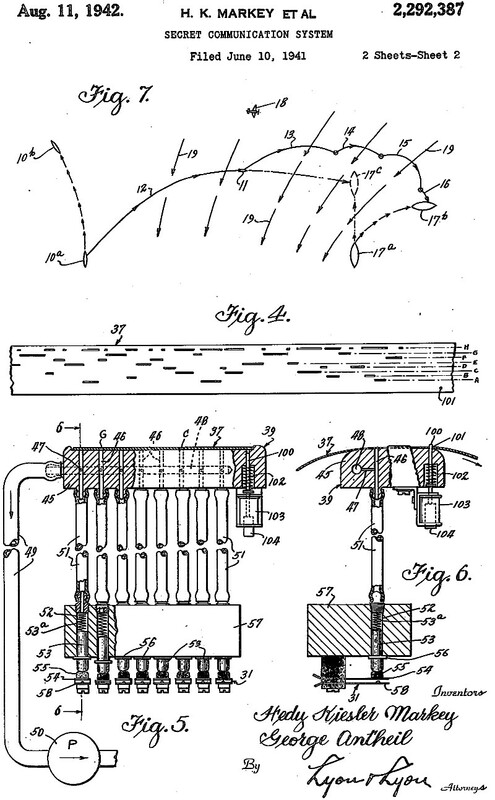 Interestingly, the patent application was filed on June 10, 1941 - six months prior to the Japanese bombing of Pearl Harbor that marked America's official entrance into World War II. Note also that the inventors are listed as George Antheil and Hedy Kiesler Markey. Hedy Lamarr was her screen name, Markey was her married name, and her birth name was Hedwig Eva Maria Kiesler. "Bombshell: The Hedy Lamarr Story," produced by Zeitgeist Films, is just now showing in select theaters around the country, so it will be a few months before it is available online or on DVD. I realize that the double entendre created by using the the term "https://www.merriam-webster.com/dictionary/bombshell" refers to both explosive torpedoes and the common vernacular for a very attractive woman. However, it is notable that a film meant at least partly to quash the concept of recognizing women for their beauty rather than for their brains would choose to make such a blatant comparison. Surrendering of core principles is often done in the pursuit of profit (aka hypocrisy). 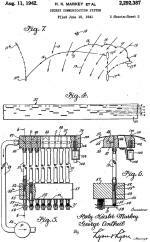 "This invention relates broadly to secret communication systems involving the use of carrier waves of different frequencies, and is especially useful in the remote control of dirigible craft, such as torpedoes. 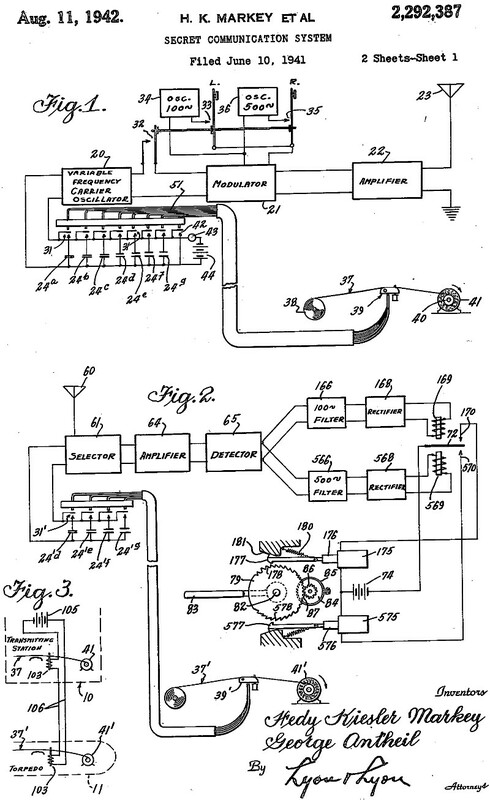 Briefly, our system as adapted for radio control of a remote craft, employs a pair of synchronous records, one at the transmitting station and one at the receiving station, which change the tuning of the transmitting and receiving apparatus from time to time, so that without knowledge of the records an enemy would be unable to determine at what frequency a controlling impulse would be sent. Furthermore, we contemplate employing records of the type used for many years in player pianos, and which consist, of long rolls of paper having perforations variously positioned in a. plurality of longitudinal rows along the records. In a conventional player piano record there may be 88 rows of perforations, and in our system such a record would permit the use of 88 different carrier frequencies, from one to another of which both the transmitting and receiving station would be changed at intervals. Furthermore, records of the type described can be made of substantial length and may be driven slow or fast. This makes it possible for a. pair of records, one at the transmitting station and one at the receiving station, to run for a length of time ample for the remote control of a device such as a torpedo. The two records may be synchronized by driving them with accurately calibrated constant speed spring motors, such as are employed for driving clocks and chronometers. However, it is also within the scope of our invention to periodically correct the position of the record at the receiving station by transmitting synchronous impulses from the transmitting station. The use of synchronizing impulses for correcting the phase relation of rotary apparatus at a receiving station is well-known and highly developed in the fields of automatic telegraphy and television."